From 2007 until 2011, Dr. Bao studied at the Huazhong University of Science and Technology, China, where he successfully completed his Bachelor in Materials Science. Following this, he commenced a Ph.D. in Materials Science, which he finished with honor in 2016. During that time, Dr. Bao spent one year at the University of California, Davis as a Joint Ph.D. Student. As an Alexander von Humboldt Fellow, he will further his research at the Chair for Organic Chemistry II at FAU, where he will be supervised by the chairholder Prof. Dr. Andreas Hirsch. 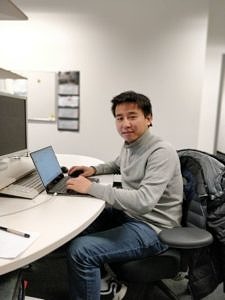 Dr. Lipiao Bao´s research interest focuses on the chemistry and material science of carbon allotropes, the synthesis and separation of novel fullerenes as well as their structure, properties and applications, crystal engineering and structural programming of molecules among others. FAU is a famous university and my friends who have studied or worked here speak highly of FAU. My research focuses on novel carbon allotropes like fullerene and carbon nanotube. Carbon allotropes such as fullerene, graphene and carbon nanotubes possess outstanding physical properties. Their applications are versatile, for example, they can be used in the fields of electronics, materials science and energy conversions. I would like to thank my PhD supervisor Prof. Xing Lu for showing me the perfect spherical structures of fullerenes, which attracted my deep interest. FAU is a famous university and my friends who have studied or worked here speak highly of FAU. Moreover, Prof. Hirsch’s group at FAU is one of the leading groups in my research area and it’s my honour to further my research here. As I mentioned, Prof. Hirsch, who holds the Chair of Organic Chemistry II at FAU and who is my supervisor, is a pioneer in my research area and has made a significant contribution to this field. At FAU, we discuss and collaborate a lot to conduct the research, which in my opinion is the way research should be done. My research group at FAU aims at the cutting-edge research of Synthetic Carbon Allotropes, Polycyclic Aromatic Hydrocarbons and Supramolecular Chemistry. In particular, their synthesis, construction, properties and versatile potential applications are deeply explored. My main interest here is the preparation of short carbon nanotubes and the exploration of their chemical properties. The ultimate goal is to identify their versatile applications. Carbon allotropes like carbon nanotubes and graphene have excellent physical properties and therefore their applications in various fields is very promising, for example, in electronic devices, which we use in our daily life. I like this place where you can not only enjoy a modern comfortable life but also take a walk into history when you want. I like the Christmas market where people celebrate together and enjoy this happy moment. Thank you for the interview, Dr. Bao.